Special thanks to all Thoughts on Java Supporters for supporting this article! Hibernate Tips is a series of posts in which I describe a quick and easy solution for common Hibernate questions. If you have a question for a future Hibernate Tip, please leave a comment below. I need to persist a simple List of Strings. Do I really need to create an extra entity for it? Don’t want to read? You can watch it here! Follow me on YouTube to not miss any new videos. Since JPA 2.0, you can use an element collection to persist a Collection of value types. You just need to annotate the attribute with @ElementCollection and the persistence provider will persist the elements of the Collection in an additional database table. The element collection might seem easier to use than an entity with a one-to-many association. But it has one major drawback: The elements of the collection have no id and Hibernate can’t address them individually. When you add a new Object to the List or remove an existing one, Hibernate deletes all elements and inserts a new record for each item in the List. Let’s take a quick look at an example. The following code snippet selects an Author entity and adds a second phoneNumber to the element collection. When you execute this code, Hibernate performs 2 SELECT statements to read the Author entity and the associated phoneNumbers. Then I add the second phoneNumber to the element collection. And Hibernate updates the Author entity, drops all associated phoneNumbers and inserts a new record for each phoneNumber. As you can see, an element collection is an easy but not the most efficient option to store a list of value types in the database. You should, therefore, only use it for very small collections so that Hibernate doesn’t perform too many SQL statements. In all other cases, a one-to-many association is the better approach. 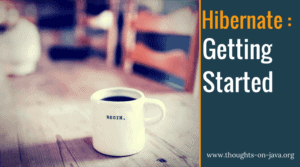 Get this Hibernate Tip as a printable PDF! Join the free Thoughts on Java Library to get access to lots of member-only content, like a printable PDF for this post, lots of cheat sheets and 2 ebooks about Hibernate. Before you use an element collection, you should take a look at the mapping of many-to-one associations. JPA and Hibernate make them very easy to use and Hibernate can handle them more efficiently. Get more recipes like this one in my new book Hibernate Tips: More than 70 solutions to common Hibernate problems. It gives you more than 70 ready-to-use recipes for topics like basic and advanced mappings, logging, Java 8 support, caching and statically and dynamically defined queries. Get it now as a paperback, ebook or PDF. Become a Thoughts on Java Supporter to claim your member perks and to help me write more articles like this. Get free access to ebooks, cheat sheets and training videos. Become a Thoughts on Java Supporter. Looking for an on-site training? Entities or DTOs – When should you use which projection?